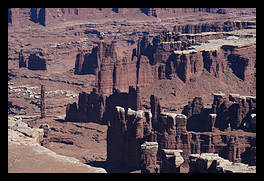 Canyon National Park is located in central Utah. There are three major parts to the park, Island In the Sky, the Needles, and the Maze. Since time was short, I only went to Island in the Sky for one day. 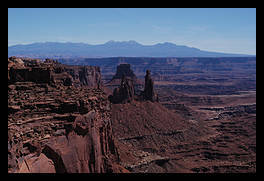 Canyon lands is a huge canyon that the Colorado and Green rivers flow through. It is not as large as the Grand Canyon, but it is spectacular and much less crowded. 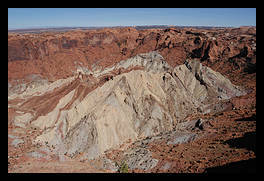 1,200 feet below you lies White Rim, a broad light-colord sandstone shelf. 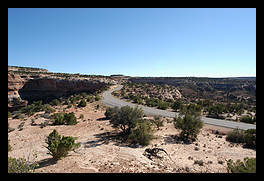 it is punctuated by additional canyons going down another 1,000 feet to the two rivers. 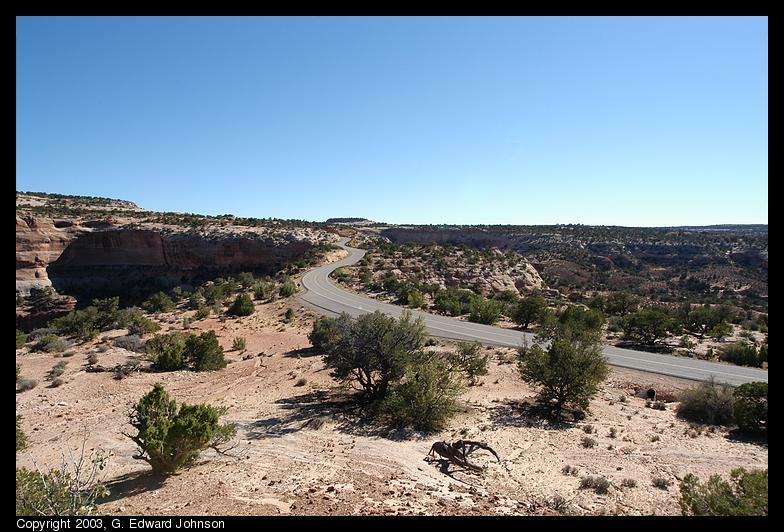 From Moab, where I stayed, it is 32 miles to the visitors center, but there are dozens of miles of road inside the park too. There are several short trails scattered through the park. I went on the Upheaval Dome trail, Mesa Arch (you can hardly call it a trail, it is very short) and the Grand View Point trail. All were worthwhile. Island in the sky is connected to the rest of the world by a skinny neck. It is only a hundred yards wide or so. When it erodes away, than it really will be an island. When this area was ranched, all that was needed was a small section of fence across this area to keep the sheep in. 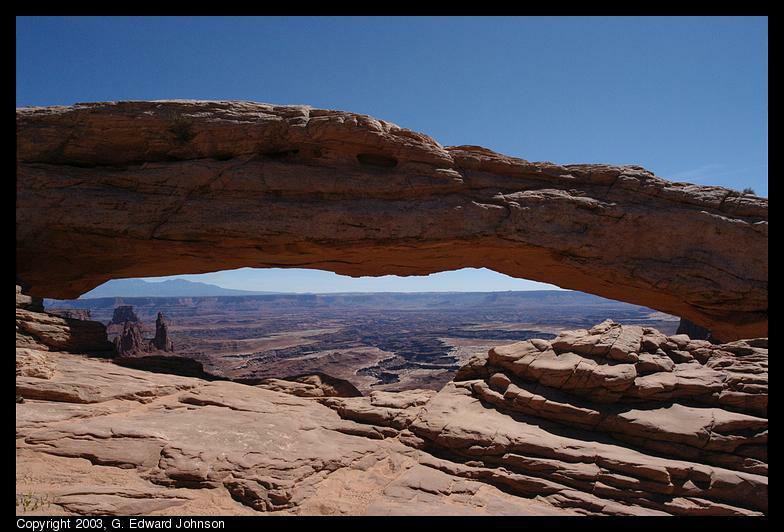 Arches are not nearly as common in this park as they are in Arches N.P. less than 50 miles away. This is a fairly low arch at the edge of a cliff. 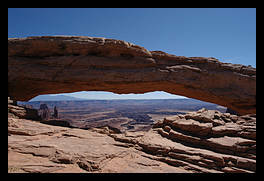 The rock at the top of the picture is Mesa arch. 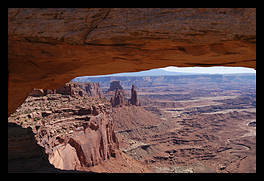 You get an interesting view of the canyon when you look through it. 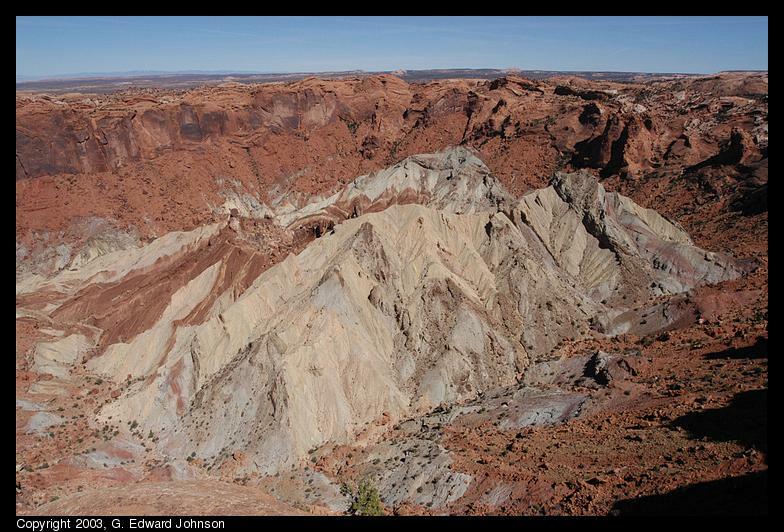 No one is sure what caused upheaval dome to form. The leading theories are that either a salt dome pushed pushed the surrounding rock up or that a meteorite crashed into the earth and this is the remains of the imact crater. In either case, there has been thousands of years of erosion to obscure the true nature of the dome. 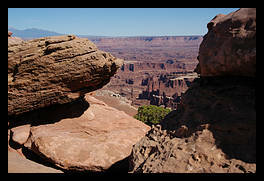 At Grand View Point, you have a great panoramic view around you. I however found a pile of rocks and took a picture through them. 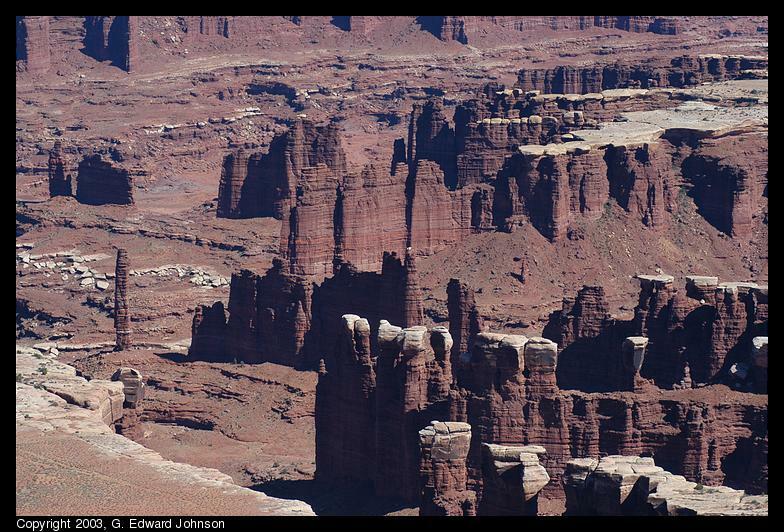 Deep within the canyon, below the white rim is another layer of rock that is eroded into fin shapes. 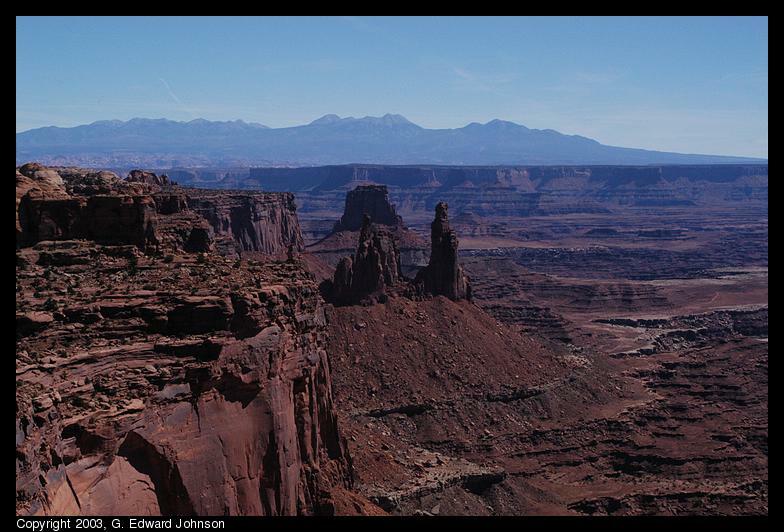 On the far left of the picture in the middle, you see a tall, skinny monolith named totem pole.